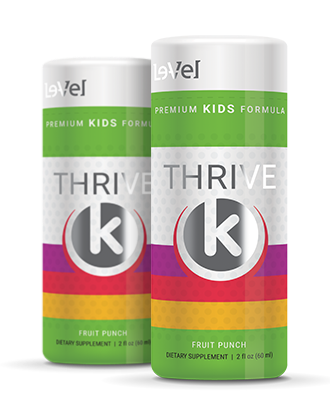 THRIVE K by Le-Vel is an innovative new approach to children's nutrition and their general health & wellness. With today's busy lifestyles and with fast foods, processed foods, and junk food at an all-time high, children’s nutrition is more important now than ever before. THRIVE K was developed and formulated to help supplement nutrition in your child's daily lifestyle. Our proprietary blend of premium grade vitamins and minerals, in an on-the-go fruit punch flavored beverage, is the perfect solution to help with your child's nutritional goals and to address nutritional gaps and deficiencies. Le-Vel is proud to introduce a true innovation for children's nutritional supplementation! Give your children the nutrition they deserve, the nutrition they need–give them THRIVE K for Kids. + These statements have not been evaluated by the Food and Drug Administration. This product is not intended to cure or prevent any disease. Keep of out reach of children. Not suitable for individuals under 18 years of age. If you are pregnant or breastfeeding consult a doctor before using this product. If you are taking any medication, or have any type of medical issue, consult with a doctor before using this product. ©2019 LE-VEL — The trademarks appearing throughout this site belong to Le-Vel Brands, LLC and are registered, pending registration, or protected by common law rights or otherwise are used with the permission of others or constitute fair use.